Royal Albert Crown "Art Deco Period" Bone China - Made in England from 1925 through 1927 Only (see Back Stamp) - A Set of (34) Pieces. 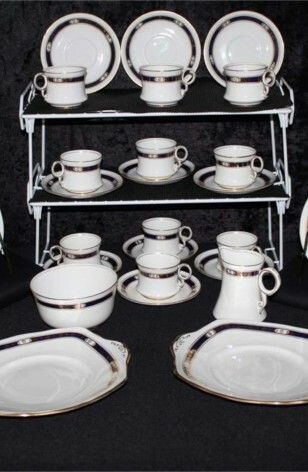 An Unusual Royal Albert Crown China Tea Set having a Service for Ten, from the Art Deco Period of 1925 through 1927 as dated by the Back Stamp. This Set is on a Bright White Background, with Cobalt Blue Ring on Rim. Inside the Blue Cobalt Ring is a 22kt Gold Pattern of Flowers and Hearts. The Cups and Creamer have the "Waist" and "Ring" Handles. Rims, Handles, and Feet are Trimmed in 22kt Gold. The Pattern on this Tea Set is both Romantic and Sophisticated. Royal Albert Crown "Art Deco Period" Bone China - Made in England from 1925 through 1927 Only (see Back Stamp). A Set of (34) Pieces. 10 - Bread/Tea/Dessert Plates - 7"